A slipped disc can occur due to acute injury or due to chronic wear and tear. In either case there will often be a misaligned vertebrae in and/or around the injured area. This will result in restricted spinal motion leading to more degeneration over time because the only way the disc obtains nutrients is through proper spinal motion. When severe disc injury occurs there is often sharp pain that can travel into the arm(s) or leg(s), aberrant motion and posture, muscle spasm, and possible neurological symptoms such as numbness, tingling, shooting pain, muscle weakness, and reflex problems. 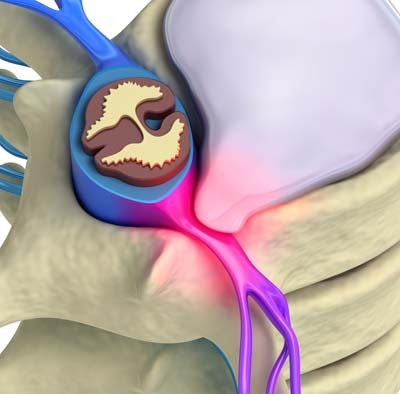 As disc injuries can cause pressure onto the spinal nerves, so to can spinal misalignments. When misalignments are present there will be distortion of the soft tissue around the opening where your nerves exit the spine and this will put pressure on those nerves. The pressure affects the ability of the nerves to properly conduct information to and from the brain, limiting your health potential. If these misalignments are left untreated then symptoms can progress in a similar manner as mentioned above.